Particle physics may seem far removed from astronomy, but we will need some basic comprehension of elementary particles before we can understand the nuclear reactions that power the stars, as well as stellar evolution, and even cosmology. Our current knowledge of elementary particles is contained in the Standard Model of Particle Physics, and it is the most outstandingly successful theory yet devised by human minds. It is almost maddeningly good: it seems that each time a new measurement is made, it only serves to reinforce the Standard Model. The model is home of the most accurate measurement in science (the gyromagnetic ratio of the electron). The measurement currently (B. Odom et al., Physical Review Letters 97, 030801, 2006) has a relative error of 7.6 * 10-13, and remarkably, the theoretical prediction is in complete agreement. We will assume that electrons, protons and neutrons are reasonably familiar. If not, all we really need to know before we continue is that atoms are made of them, the electron is negatively charged, the proton is positively charged, and the neutron is neutral. 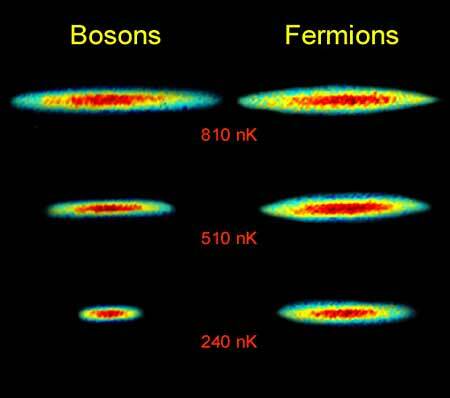 As the temperature is lowered closer and closer to absolute zero, the bosons continue to shrink together, but the fermions are limited by the Pauli Principle. There are two main types of leptons: electrons and neutrinos (ν). Except for the neutrinos, all quarks and leptons carry electrical charge and exchange photons, which mediate the electromagnetic force. All left-handed quarks and leptons can exchange W and Z bosons, which mediate the weak force. (A particle is left-handed when its spin is parallel to its magnetic moment.) The weak force allows one type of quark to change into another, or an electron to change into a neutrino (or vise versa). Only the quarks can exchange gluons, which mediate the strong force, and hold quarks together. Individual quarks are never seen; they are always found as a bound pair called a meson, or a bound triplet called a baryon. The most common baryons are protons and neutrons. The strong force is about 13.7 times stronger than the electromagnetic force. The weak force is weaker by a factor of 10,000 than the strong force, although it is not the weakest: gravity is 1036 times weaker. Gravity only appears to be so strong because of the sizes of the sources of the gravitational field: planets, stars and galaxies. There is also antimatter; for each fermion, there is an associated antiparticle. An antiparticle is identical to its ordinary "partner" in every way except its charge and helicity (whether its spin is parallel or antiparallel to its momentum). The antiparticle associated with the electron is the positron (e+). It is expected that issues involving handedness and helicity will ultimately explain why there is more matter than antimatter in the observable universe. "1H" denotes a proton: this Hydrogen nucleus has no accompanying electron to make it an atom because the intense heat (over 10 million K) necessary to allow fusion to occur has stripped the electron off, making it an ion. "2H" denotes a Deuterium nucleus, which consists of a proton and a neutron, bound by the strong force. The subscript on the neutrino indicates that it is specifically an electron neutrino: the weak partner to the electron, and not to a muon or tau particle (which are heavier leptons). To understand this reaction, we need to know the quark content of the proton and neutron. The proton is made up of 2 "up" quarks and 1 "down" quark (up and down are just labels), bound by the strong force. The neutron is made up of two down quarks and one up quark, similarly bound. The up quark is usually assigned an electric charge of +2/3, and the down a charge of -1/3, of the magnitude of that of the electron. This makes the electric charge "come out even": we call this conservation of charge. Ordinary matter content of the Standard Model of Particle Physics. The "bar" above the second neutrino marks it as an anti-neutrino; "u" and "d" stand for up and down quarks, respectively. Fusion of two protons into Deuterium. This allowed the resulting neutron to be bound to the remaining proton, making the Deuterium nucleus. But because there were no leptons on the left hand side of the reaction, there must be none on the right: the positron, with lepton number -1, plus the neutrino, with lepton number +1, add up to 0 leptons. We call this lepton number conservation. Since protons and neutrons are both baryons, we also have baryon number conservation in this reaction. and comes about because the binding energy of the resulting Deuterium nucleus is negative. Differences in binding energies also account for the excess energy released in fission. 1967 - Glashow, Weinberg and Salam formulate Electroweak theory 2013 - we seem to have a Higgs! Note: Electroweak theory and QCD are incorporated into the Standard Model. It is hoped that this little "experiment vs. theory" reality check will clarify some of the ideas presented in the public forum in a properly scientifically conservative light. ©2014, Kenneth R. Koehler. All Rights Reserved. This document may be freely reproduced provided that this copyright notice is included.